Expensive but worth the money. A good battery delivered very quickly. Service first class ordered one day here the next. Difficult to install in awkward locations as no handles. These batteries are a direct replacement for units fitted 10 years ago and are only now starting to fade. Hope the new ones are as good. quick delivery with battery in excellent packaging and at a good state of charge. looks good so far - I'll be better able to test the battery when it's in it's proper charge/dischage environment on the boat this coming summer. Prompt and efficient service. Who could ask for more! 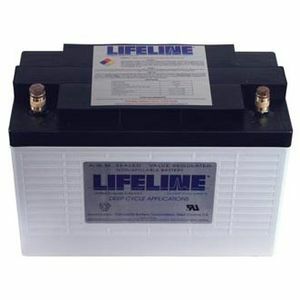 The 2 lifeline batteries were in stock and were offered for dispatch the next day. When they arrived they were very well packed especially important as the delivery system "UK post" had given them their usual treatment. They arrived on time and the superb packaging saved the day! I have had 3 other Lifeline batteries and they are the best you can buy for demanding Marine work. Very good service - a problem with the carrier was dealt with quickly and a replacement battery dispatched quickly.